A half body carving done in the Ol' English tradition. This is a smoothie, half body which saved my client a considerable amount of money. 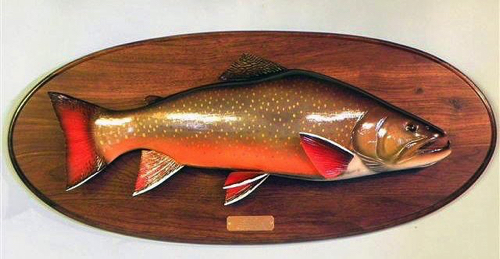 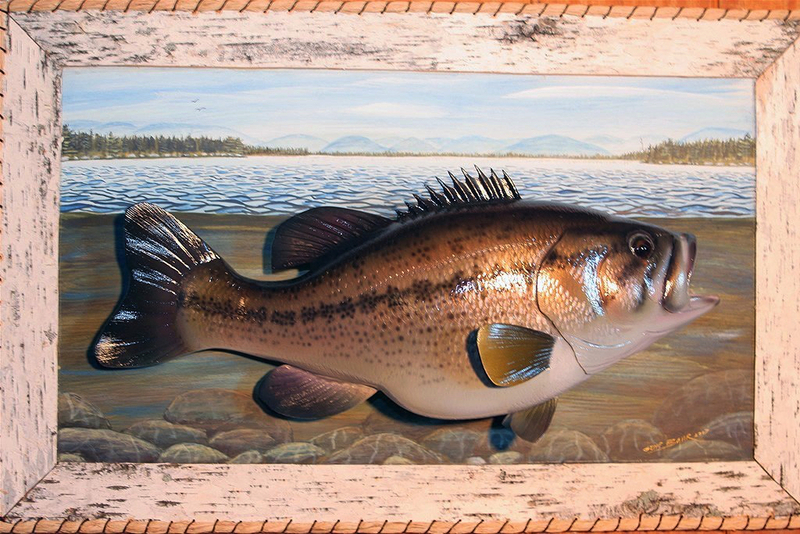 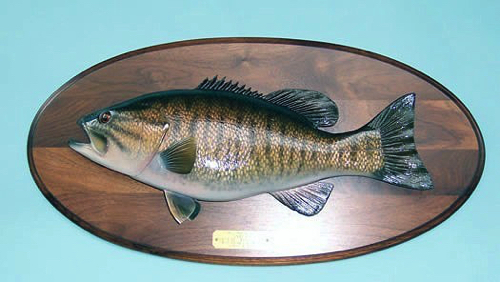 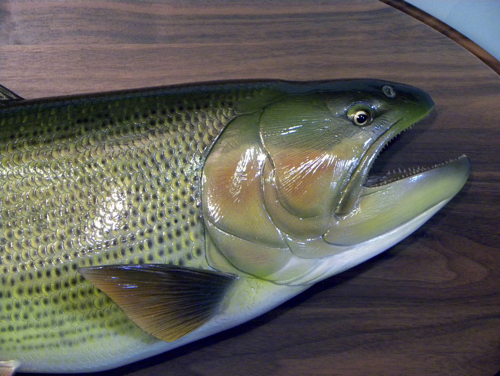 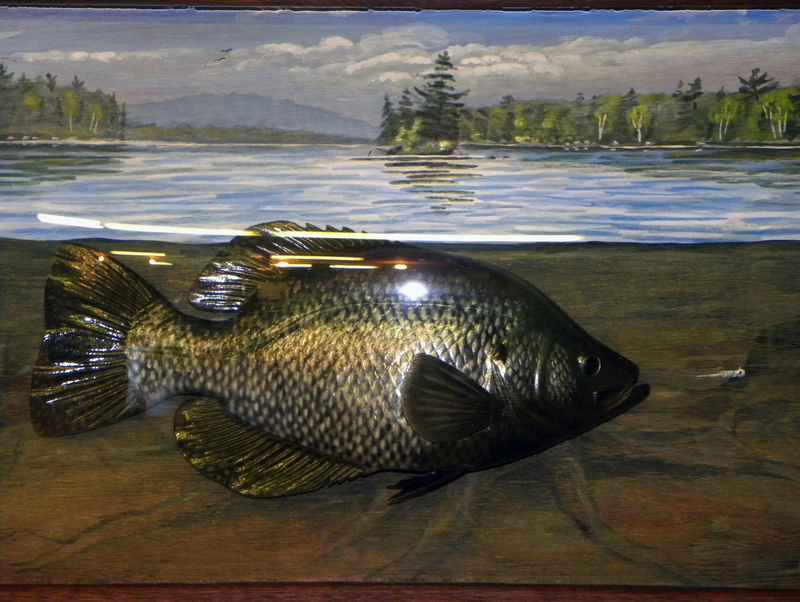 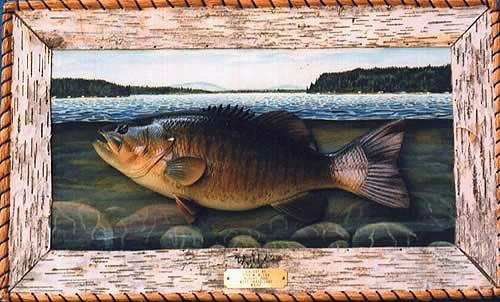 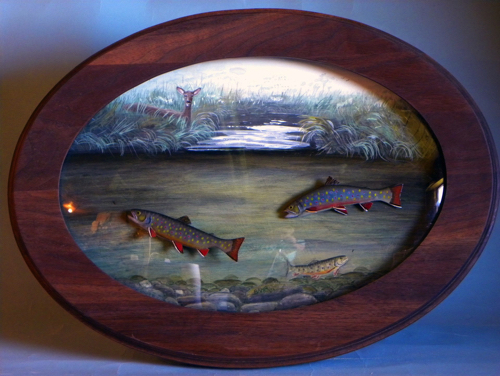 19’’ Brook Trout mounted on a solid Walnut panel, with a hand painted scene placed under an Acrylic Bubble. 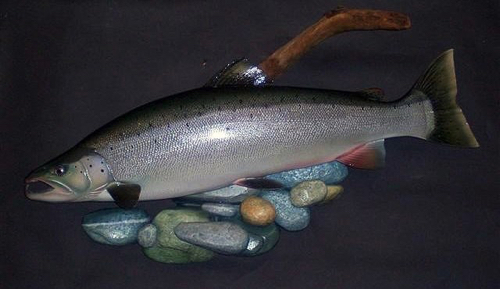 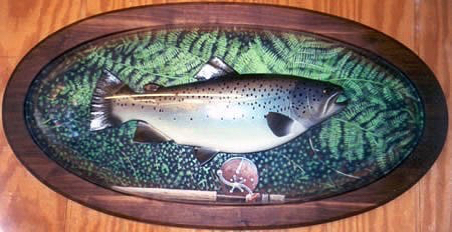 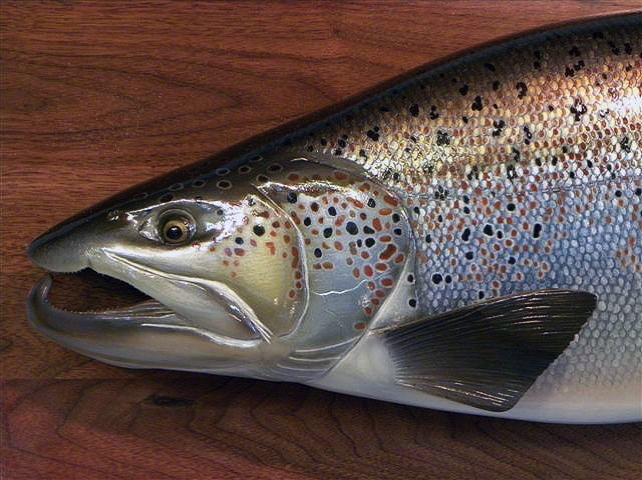 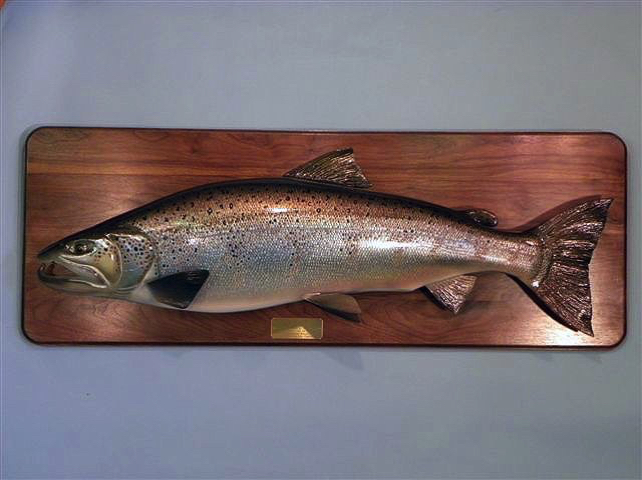 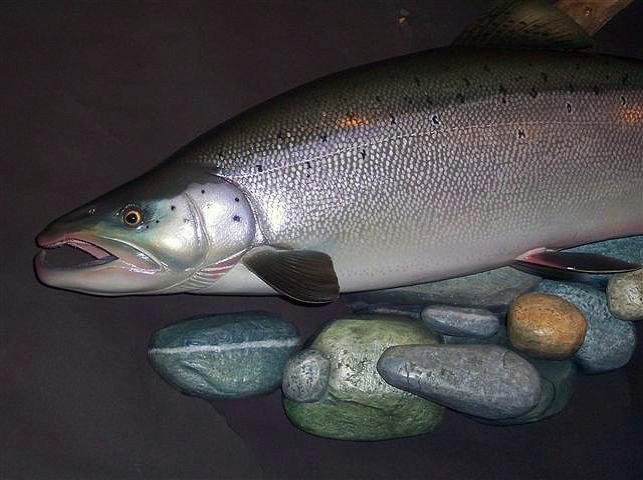 20" Landlocked Salmon mounted on a solid Walnut panel, with a hand painted scene placed under an Acrylic Bubble. 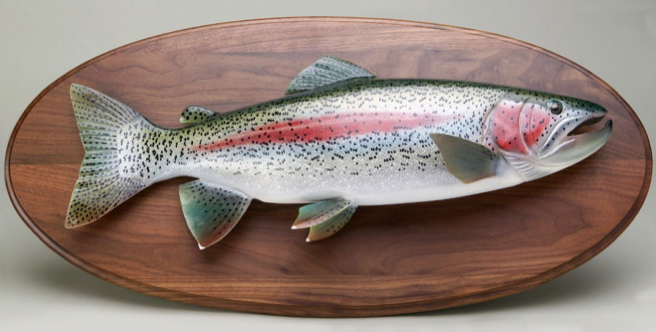 24’’, 7 lbs Alaskan Rainbow, on a Walnut panel. 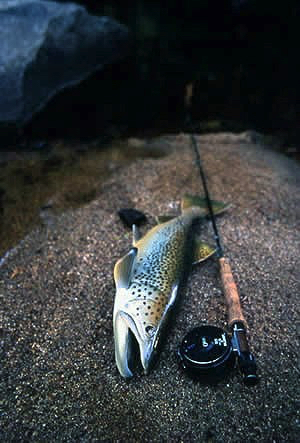 22" Brown Trout laying on sandbar. 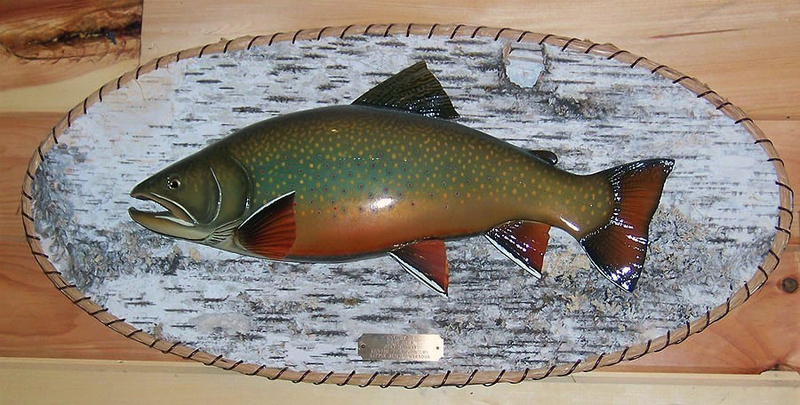 2 Brook Trout chasing a fly. 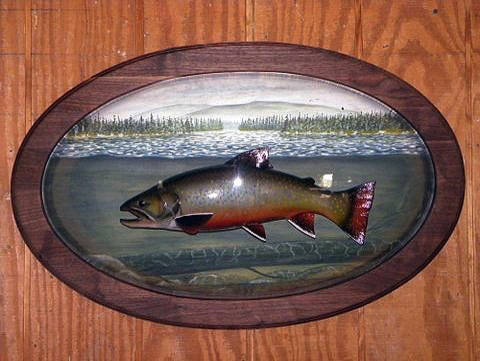 Mounted on a Walnut panel. 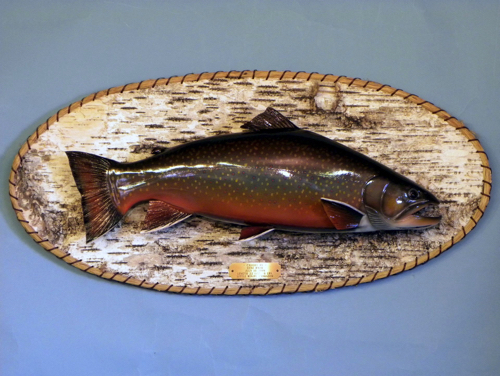 Bone Fish mounted on a Walnut plaque. 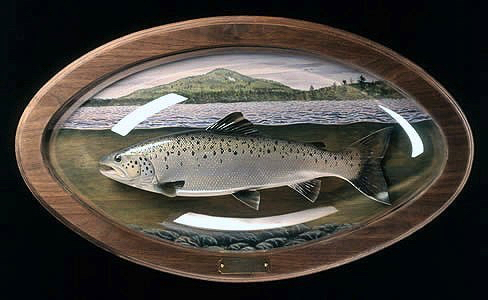 10 lbs Brown Trout lying in ferns, with an oval Walnut frame mounted behind an acrylic dome. 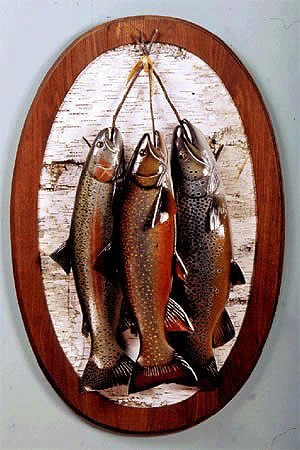 Rainbow Trout, Brook Trout and Brown Trout, mounted on a Birch Bark panel with a Walnut frame. A Brook Trout and Salmon mounted on a Birch plaque. A Pickerel mounted on a weathered plank. 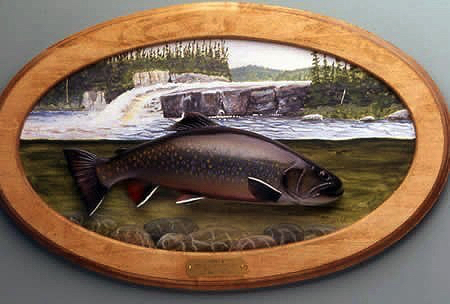 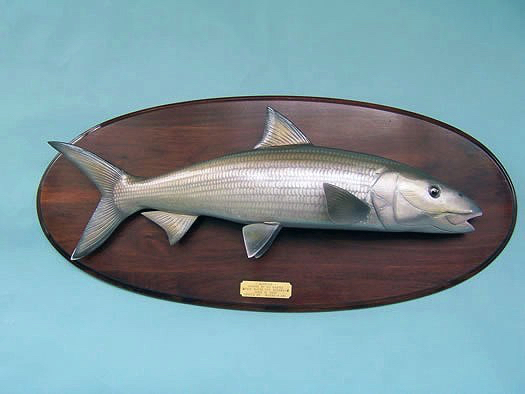 Note: This piece will be displayed at the Federal Fish and Wildlife, National Conservation Training Center. 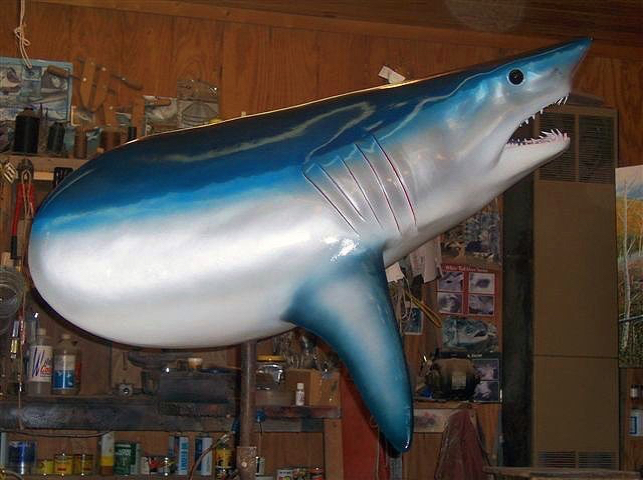 Note: Our largest fiberglass project to date. 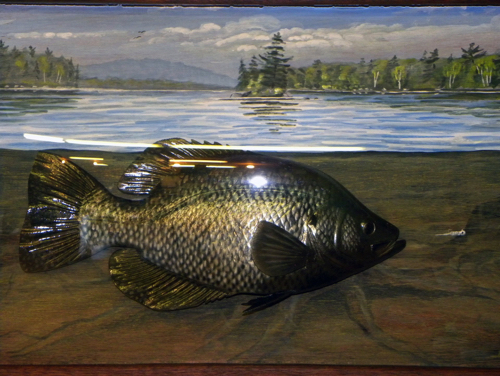 Blue Gill, Black Crappie, Yellow Perch and White Perch on barn board. 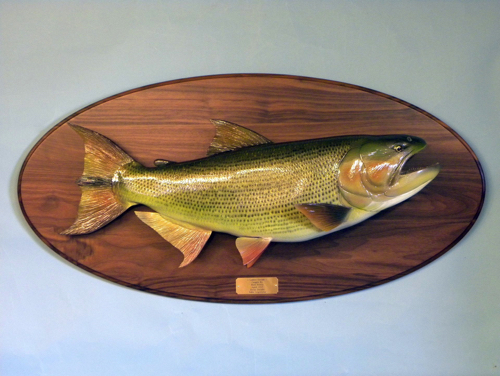 38'' Northern Pike on barn board. 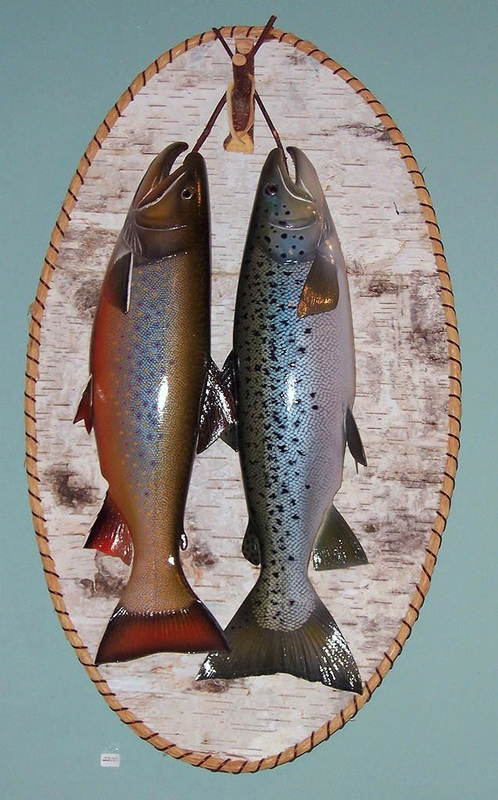 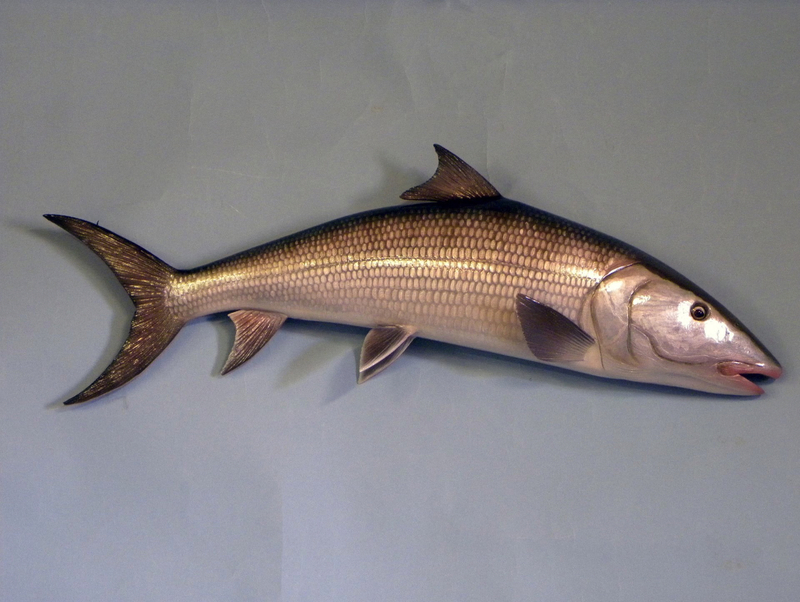 Below you will find examples of both “Smoothie” and “Detailed” Wall Mount Fish Carvings created by Gene. 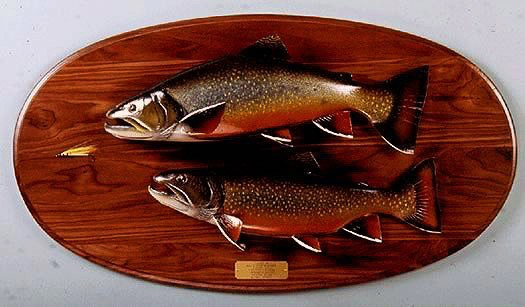 Please visit the Pricing page to learn about the differences of these two carvings.